I love to do cakes, but as I considered my crazy schedule leading up to my son’s birthday party, I decided that it would be best to make cupcakes. 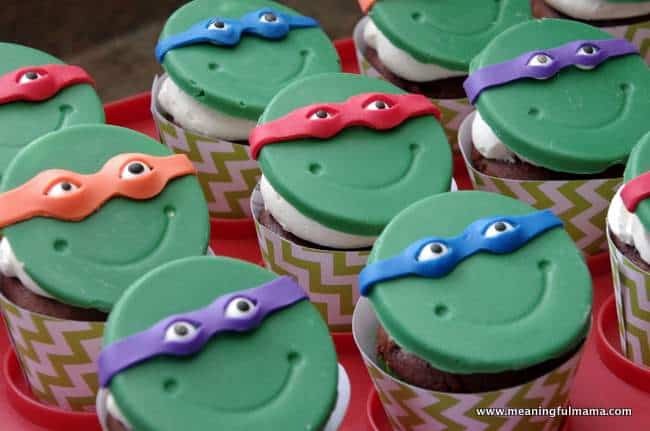 I really enjoy making cupcakes as well, and I found a way to make his Teenage Mutant Ninja Turtle cupcakes both adorable and fairly easy. 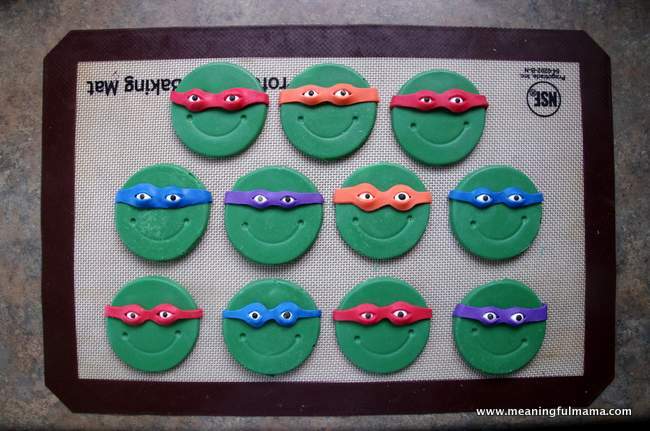 If you are looking for more food ideas, you’ll have to check out my Teenage Mutant Ninja Turtle juice boxes as well. Also, if you just enjoy looking at cake and cupcake designs, I invite you to visit my cakes tab. The most important part about making cupcakes is having an amazing recipe as well as a fabulous design. Since the turtles come from the sewers and underground, which make me think of dirt, I decided to do a chocolate cupcake, and this recipe is my favorite. If you would prefer a white cake, I think you’ll love my white velvet, which is always loved by guests. Another popular cake flavor is my red velvet cake. Now that you have the perfect cake recipe, it’s time to make my fabulous buttercream frosting. You are set. The first step is to just make the cupcakes and frost them. I did a classic swirl on the top with a large decorating tip. Here’s a great post on different basic frosting techniques if you want more guidance. I also made my own cupcake liners out of chevron patterned green paper to make them even more adorable. 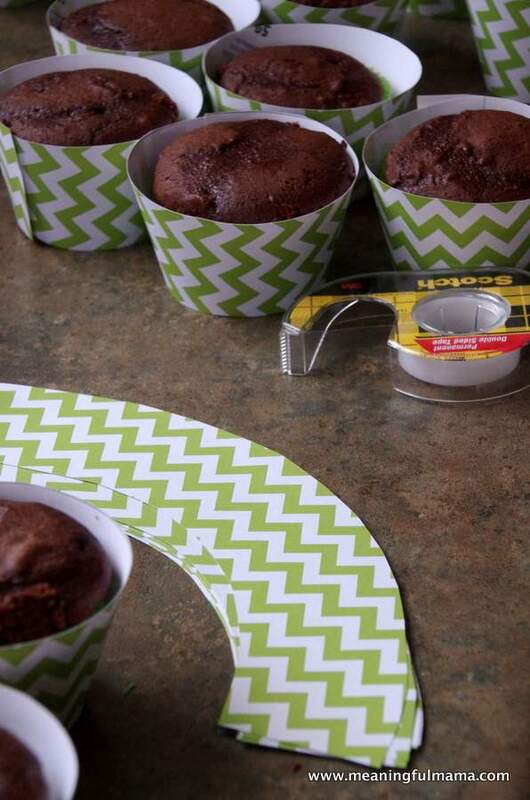 I think you’ll love having this cupcake liner template in your arsenal. 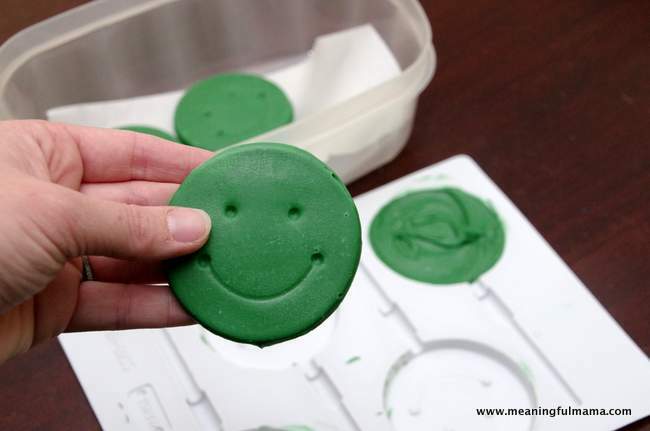 The first thing you need to do is get a smile face chocolate mold and green candy melts chocolate. Don’t let this process intimidate you. It is one of the easier things you’ll do. You can melt these chocolates in the microwave, add them to the mold, stick them in the refrigerator, and then they pop out of the mold just as you’d want them. 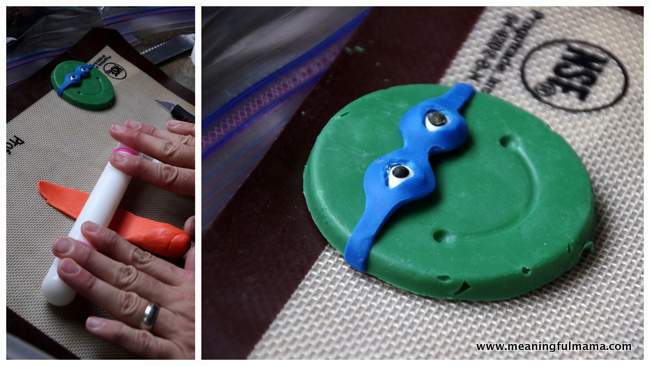 When you are filling the mold, you can either lightly drop the mold onto the table or tap underneath to try and remove any bubbles that may occur. For more tips and ideas for using Candy Melts, please see this tutorial. My husband was awesome and did the next part for me. He rolled out the different color fondants and hand cut each little mask. There is a slight curve where the eyes will set, but when you add the candy eyeballs and slit to the mask, it makes that curve out fairly naturally. My husband put down the candy eyeballs onto the chocolate and then added the cut out fondant mask on top. 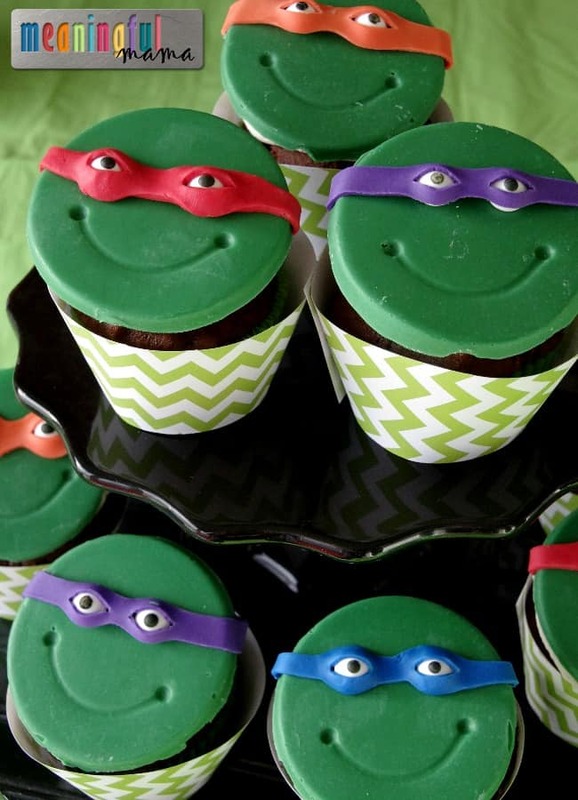 Make enough of these in your Teenage Mutant Ninja Turtle colors of red, blue, orange and purple to cover all your cupcakes. Aren’t they fun? All you do is add these to the top of your cupcakes, and you are all set.